What does a diagram sound like? What does the shape of a sound feel like? Researchers at Queen Mary, University of London are finding out. At first sight listening to diagrams and feeling sounds might sound like nonsense, but for people who are visually impaired it is a practical issue. Even if you can't see them, you can still listen to words, after all. Spoken books were originally intended for partially-sighted people, before we all realised how useful they were. Screen readers similarly read out the words on a computer screen making the web and other programs accessible. Blind people can also use touch to read. That is essentially all Braille is, replacing letters with raised patterns you can feel. The written world is full of more than just words though. There are tables and diagrams, pictures and charts. How does a paritally-sighted person deal with them? Is there a way to allow them to work with others creating or manipulating diagrams even when each person is using a different sense? That's what the Queen Mary researchers, working with the Royal National Institute for the Blind and the British Computer Association of the Blind have been exploring. Their solution is a diagram editor with a difference. It allows people to edit 'node-and-link' diagrams: like the London underground map, for example, where the stations are the nodes and the links show the lines between them. The diagram editor converts the graphical part of a diagram, such as shapes and positions, into sounds you can listen to and textured surfaces you can feel. It allows people to work together exploring and editing a variety of diagrams including flowcharts, circuit diagrams, tube maps, mind maps, organisation charts and software engineering diagrams. Each person, whether fully sighted or not, 'views' the diagram in the way that works for them. The tool combines speech and non-speech sounds to display a diagram. 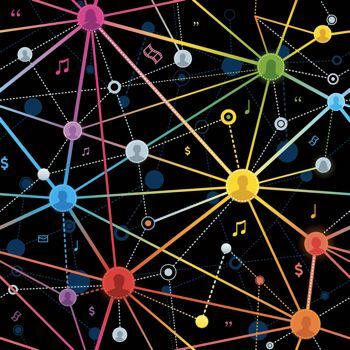 For example, when the label of a node is spoken, it is accompanied by a bubble bursting sound if it's a circle, and a wooden sound if it's a square. The labels of highlighted nodes are spoken with a higher pitched voice to show that they are highlighted. Different types of links are also displayed using different sounds to match their line style. For example, the sound of a straight line is smoother than that of a dashed line. The idea for arrows came from listening to one being drawn on a chalk board. They are displayed using a short and a long sound where the short sound represents the arrow head, and the long sound represents its tail. Changing the order they are presented changes the direction of the arrow: either pointing towards or away from the node. 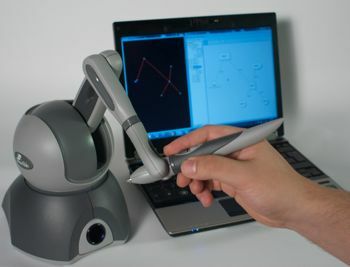 For the touch part, the team use a PHANTOM Omni haptic device, which is a robotic arm attached to a stylus that can be programmed to simulate feeling 3D shapes, textures and forces. For example, in the diagram editor nodes have a magnetic effect: if you move the stylus close to one the stylus gets pulled towards it. You can grab a node and move it to another location, and when you do, a spring like effect is applied to simulate dragging. If you let it go, the node springs back to its original location. Sound and touch are also integrated to reinforce each other. As you drag a node, you hear a chain like sound (like dragging a metal ball chained to a prisoner?!). When you drop it in a new location, you hear the sound of a dart hitting a dart board. The Queen Mary research team have tried out the editor in a variety of schools and work environments where visually impaired and sighted people use diagrams as part of their everyday activities and it seems to work well. It's free to download so why not try it yourself. You might see diagrams in a whole new light.